Weekly Photo Challenge: Inside | Oh, the Places We See . . . This week’s WordPress Weekly Photo Challenge: Inside opened with the idea that So much of life happens inside something. The statement definitely applies to me since I travel frequently with my job as a trainer of teachers. I’m inside a plane, a hotel room, a school, or, as in this case, inside an airport terminal watching people on the moving sidewalk! Inside Terminal C — Chicago O’Hare International Airport! And here’s hoping that as school winds down, I’ll be outside a little bit more! For more entries in this week’s Weekly Photo Challenge: Inside, click here. 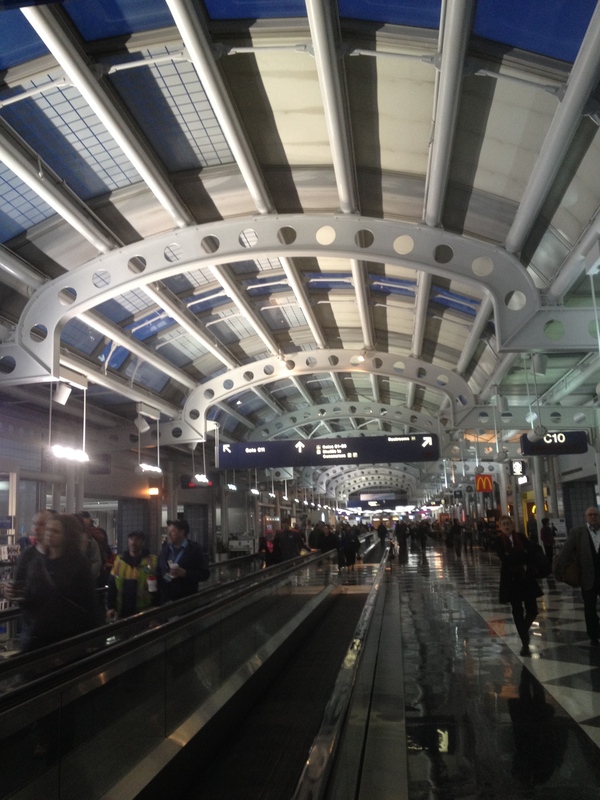 This entry was posted in Travel, Weekly Photo Challenge and tagged Chicago O'Hare, postaday. Bookmark the permalink. I wondered what yours would be. Nice job, Rusha! Thanks for taking a look. I feel like a rat in a maze sometimes when I’m in big airports breathing that captured air!! !